Our first stop in Utah was Zion National Park. There was free National Forest camping near the park and we ended up staying two days before deciding to actually venture into the park. We realized that up until this point we had camped somewhere different almost every night. Camping somewhere new every day was not how we planned to travel and we keep telling ourselves we’ll slow down at some point, just waiting on the perfect (warmish) spot! 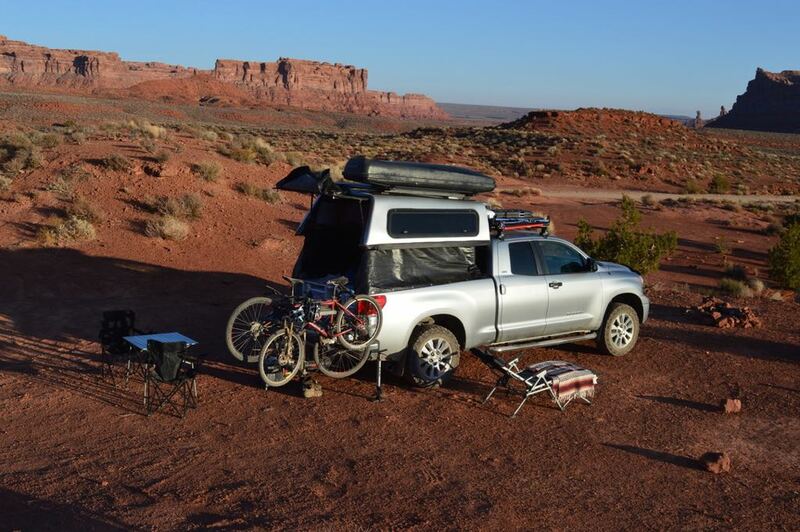 Spoiler, we finally did end up slowing down and spent four full days in and around Moab. Due to the dog limitations in Zion National Park we were only able to hike one trail called Pa’rus Trail which it turned out was really more of a paved walkway. We would have loved to venture further into the park but we’ll have to save that for next time when we aren’t traveling with our furry family member Roo. Given the trail limitations we didn’t spend too long at the park which ended up being a good thing as when we returned to Toby there was a ticket on the windshield saying “Tow – Do Not Move.” There were many vehicles in the lot with the same sticker; the lot was for larger vehicles or campers, we thought Toby could qualify but no such luck! Parking was very limited which is why we took the chance initially. We even saw a Vanagon with a sticker and I would certainly say that was a camper! Mitchell and I quickly debated if we could just drive out and take off the sticker (which I was in favor of…) but Mitchell decided to chat with the nearby park ranger who simply told us don’t worry about and it it’s our luck day as the tow truck hadn’t arrived yet. We were very glad we did not have to go pay the fine and rescue Toby! We’ve decided we’ll have to be extra careful of where we park as the thought of coming back to a parking spot to find our home on wheels AWOL does not sound fun! 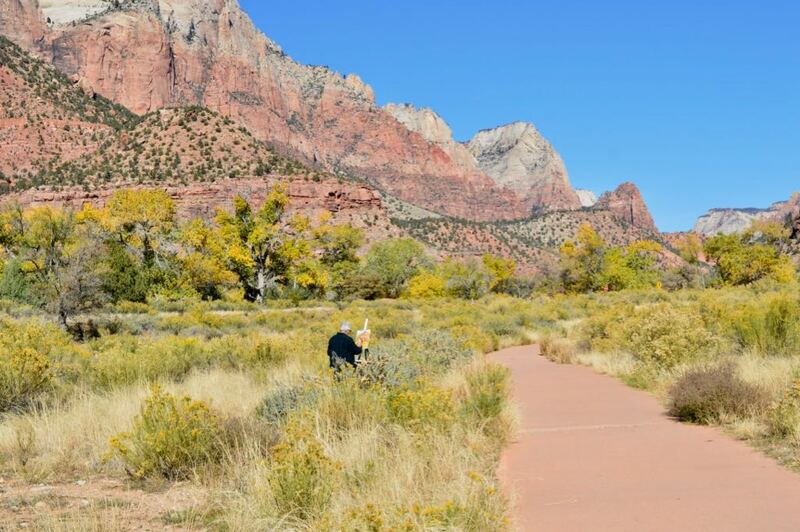 An local artist painting in Zion National Park. 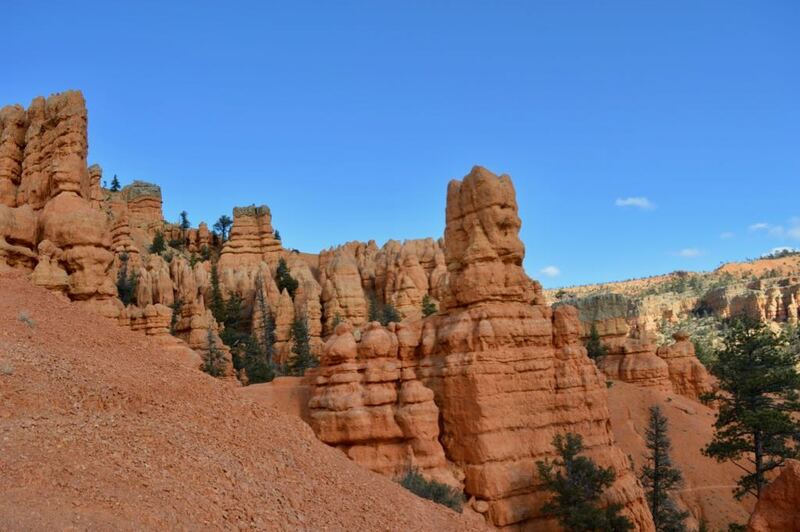 After Zion we headed towards Bryce Canyon National Park. The weather was feeling very “wintry” and it was super windy the day we visited so we did not spend long at Bryce Canyon. We toured around in Toby and snapped a few pictures before retreating to the shelter of the vehicle. Even with the insane amount of wind the canyon was spectacular. 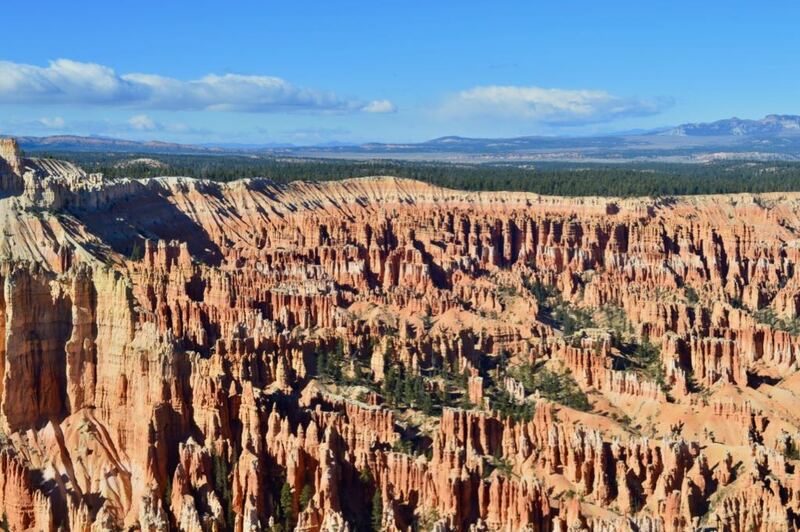 Amazing views of Bryce Canyon. At this point in our Utah adventure it was time for laundry and showers so we headed to a nearby town called Panguitch and stayed at a campground right in the town center called Hitchin’ Post Campground. It checked all of the boxes and even had Wi-Fi! Although, the WI-Fi didn’t work in our tent spot unfortunately so Mitchell and I would go hangout in the bathroom or laundry room area to try and stay warm while picking up a good signal. I was using the Wi-Fi I the laundry room for a little while catching up on work and one gentleman kept coming back in to check on his laundry and giving me a strange look, the only explanation can be that he though I was going to steal his laundry? The night we spent here was probably one of the colder nights we had on the trip and we were grateful we invested in the propane heater we picked up in Las Vegas. I was also grateful I could Wi-Fi from the warmth of the bathroom and/or laundry room – ha. 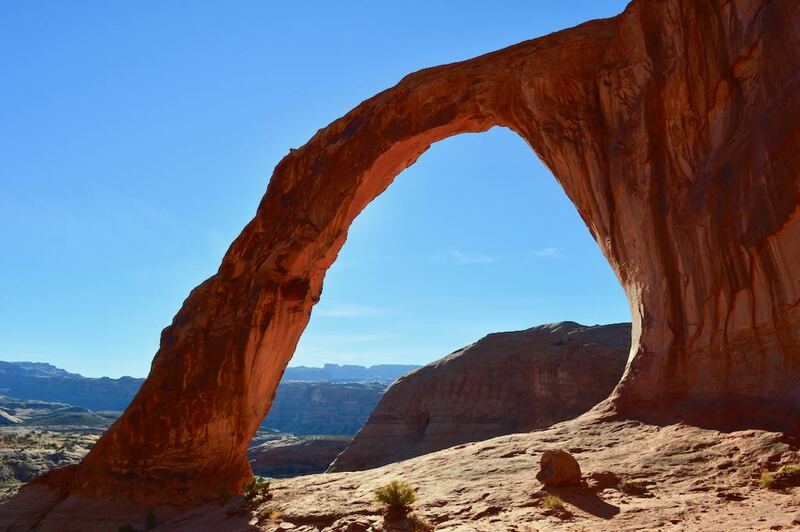 We continued our journey around Utah and headed towards Moab. Rather than taking the direct route we decided to take the scenic route through Coral Reef National Park. We hadn’t planned to visit this park but it ended up being one of our favourite National Parks simply because it was less busy and little more spread out. We also had the chance to check out check out petroglyphs created by Native Americans around AD 600 to 1300! Capitol Reef National Park. We like the contrast of the snowy mountains and red rock! 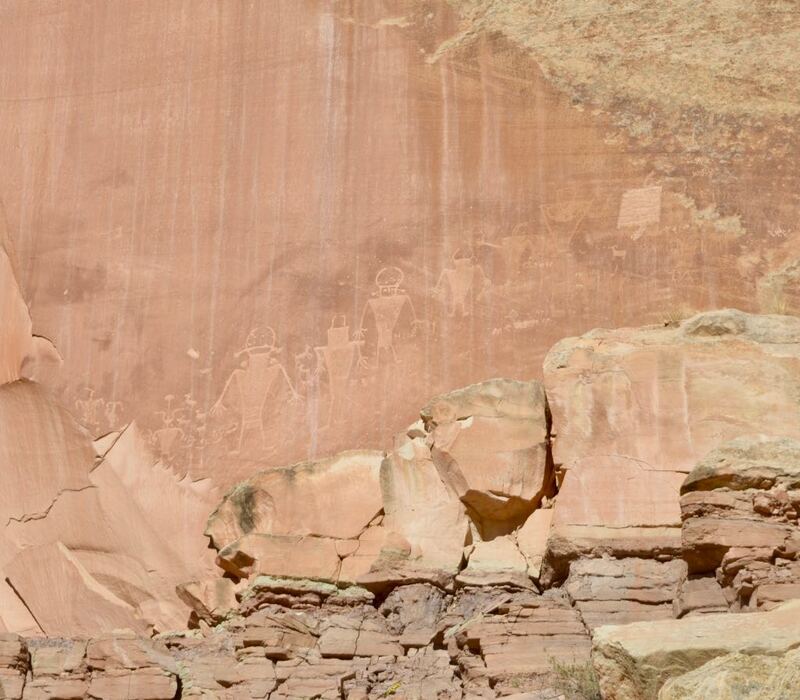 Petroglyphs in Capitol Reef National Park. 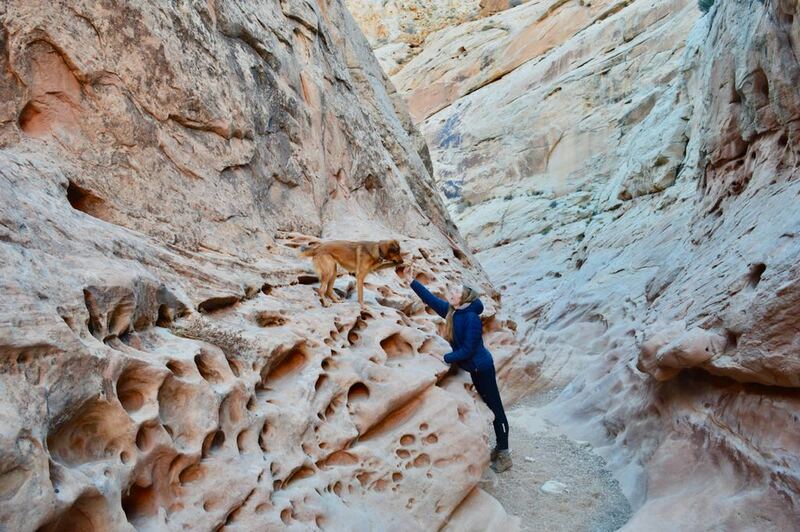 On our way to Moab we also had a chance to check out our first slot canyon! One of our favourite places so far was Moab and we ended up speeding four days hiking and biking and exploring parks in the area. There were great wild campsites and the town had a quaint outdoorsy feel. We felt right at home! The Moab library was awesome and had free Wi-Fi. I was able to work while Mitchell and Roo adventured around town and some of the nearby trails. Corona Arch Trail near Moab. 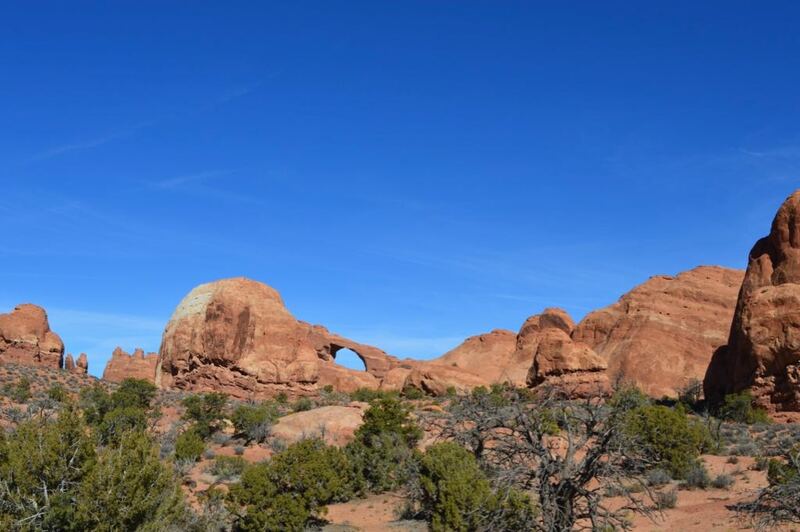 Arches National Park. Right near Moab. 1. Drive through Bear Ear National Monument on your way to Natural Bridges National Monument. Bear’s Ear monument is not currently marked but you are apparently driving through it when you are traveling on highway 95 towards Natural Bridges. 2. Tour Natural Bridges Monument. There are a few hikes or you can simply do the scenic loop. 3. Take highway 261 towards Mexican Hat. 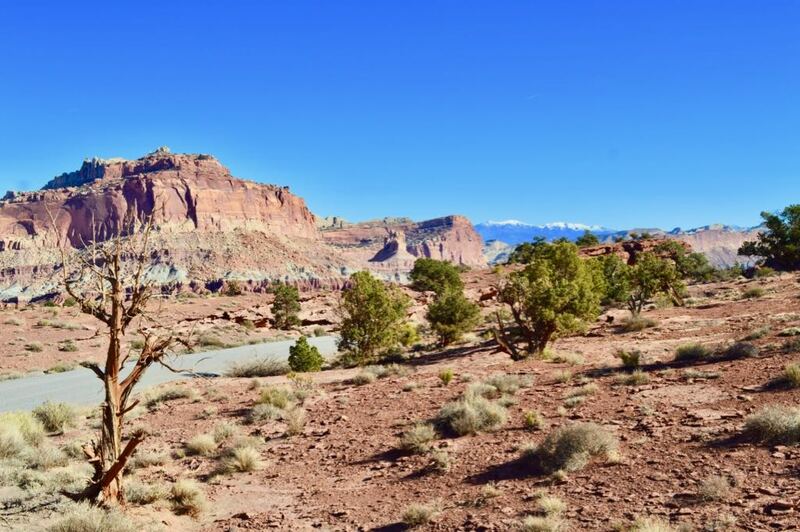 By going this way you will be able to do the Moki Dugway which is steep twisting road that gives you an amazing view of the Valley of the Gods as you drive downwards. 4. Tour the Valley of the Gods (there is also lots of free camping in this area if you want to extend your trip). 5. Drive through Mexican Hat and on to Monument Valley! We did this route with a stop overnight in Valley of the Gods and thought it worked out perfectly. We actually would almost recommended Valley of the Gods over Monument Valley except for the fact that Monument Valley is such an iconic landscape. Much Valley of the Gods is actually similar to Monument Valley. 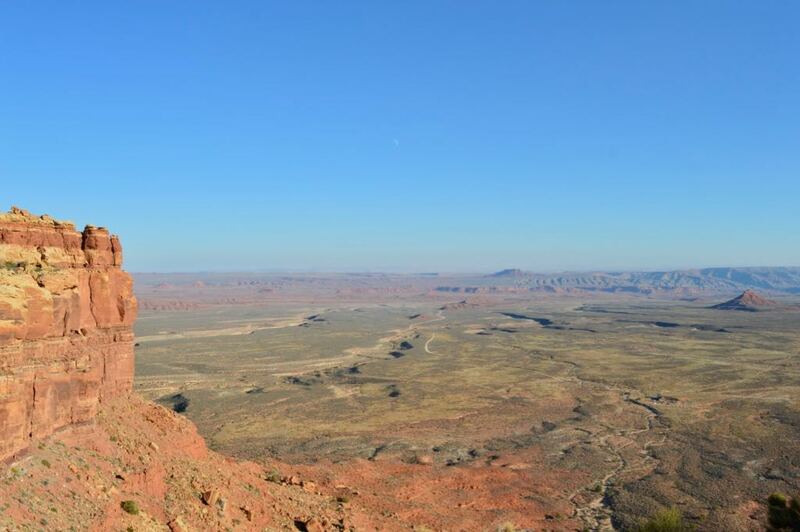 Moki Dugway view of Valley of the Gods. Camping in Valley of the Gods. 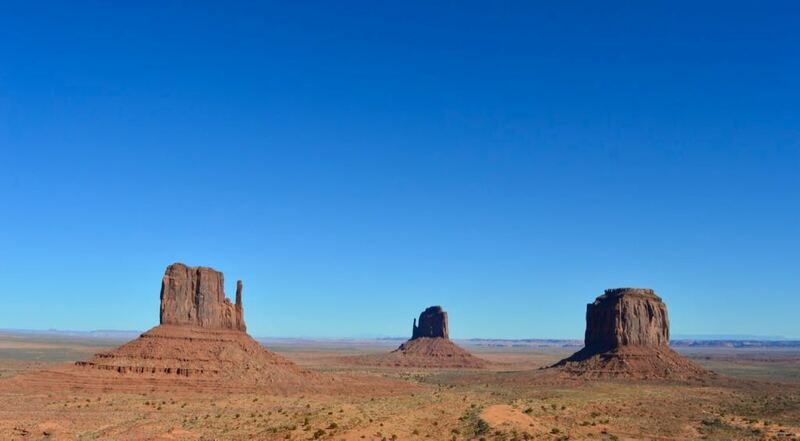 Monument Valley itself is still worth seeing, it is on Navajo Tribal Land. Utah we will be back!